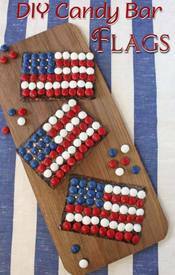 Looking for a quick, easy and patriotic last minute 4th of July snack! Oh Nuts has got your covered with their DIY Candy Bar Flags!! The chocolate bar is packed with crunch mix-ins (like cereal, toffee or chopped nuts), topped with red, white and blue candies! With only FOUR ingredients, anyone can make these! !